Bracket busters in the First Round? The bane of March! These are the matchups that everyone loves to see, yet few bracketeers can appreciate. The heartbreaking exploits of these proverbial Davids, as they sling their collective projectiles across the exposed foreheads of basketball powerhouses adorned in the armor of a higher seeding, brings about an equal dose of elation and pain in the opening rounds of the tournament. As the first set of games came to an end last night, there were seven high seeds who were shown the exit from this year’s big dance, by teams that prognosticators believed wouldn’t stand a chance. That’s two more than occurred over the same period during last year’s NCAA Tournament. The most shocking was the Yale Bulldogs chomping the Baylor Bears in the rear end by a final score of 79-75. This was the Yale’s first tournament appearance since 1962. Perhaps felled by overconfidence due to their clear advantage in size and athleticism, Baylor was outrebounded by the noticeably smaller Ivy League champions, who weren’t in the least bit intimidated. Makai Mason led the way for the Bulldogs with a career-high 31 points. Justin Sears backed him up with 18. It was the first NCAA win in the century-old history of Yale University Men’s Basketball. The University of Arkansas-Little Rock Men’s Basketball teams wanted in on that David vs. Goliath action as well, deciding they would much rather put up a spirited fight against the Purdue Boilermakers than take an early exit. The Boilermakers allowed the Trojans’s to fight back while Josh Hagins hit a game-tying three-pointer from the realm of ridiculousness as time expired. Hagins outscored Purdue by his lonesome to the tune of 21-20 over the final 15 minutes, as the Trojans pulled out an 85-83 double overtime win. Big East Tournament Champions Seton Hall were the No. 6-seed in the South Region, but Isiah Whitehead’s chuck-and-duck performance that saw him go a horrendous 4-24 from the field doomed the Pirates, who lost to No. 11 seed Gonzaga 68-52. 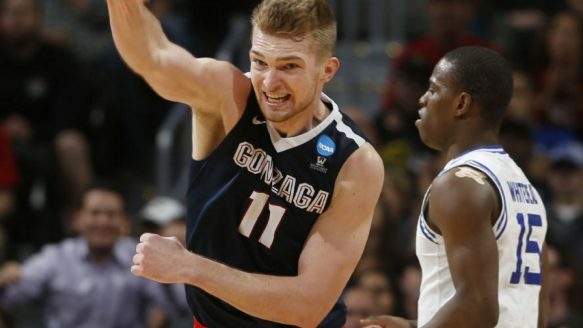 Domintas Sabonis had 12 points and six rebounds at halftime on his way to a burly 21 and 16. The veteran backcourt of Fred VanVleet and Ron Baker seemingly have been representing for Wichita State for a hundred years, but people keep sleeping on them as if they were narcoleptic. But it was the Arizona Wildcats who should have stayed woke. The Shockers scored 22 points off 19 Arizona turnovers en route to sending the Wildcats packing, 65-55. The No. 9 seed Providence Friars also advanced by beating No. 8 seed USC, 70-69, but can you really call it an upset? Historically, 8 versus 9 is one of the most upset-prone, but that didn’t make the flight back home any easier to stomach. Similarly, Kevin Ollie’s ninth seeded University of Connecticut Men’s Basketball team ousted the No. 8 seed Colorado Buffaloes, 74-67, but it really wasn’t even that close. With half of the first round in the books, look for more bracket busters to shake things up as the field shrinks to 16 by the end of the weekend.